Recently I have written a series of pieces that are concerned in one way or another with the presentation of unique, and yet similar, events or objects. In copies I-V, I examine the same material in subtly different ways as if under a microscope. The solo line in each piece is played in one take, as live. The recording, replete with tiny imperfections such as string noise and feedback associated with the use of the EBow, is kept in full. These unintentional sounds are sampled and amplified and become part of the continuum. copies I-III were first performed by the composer at Islington Mill, Salford, 19 October 2016, and subsequently broadcast as part of Exposure on BBC Radio 3. 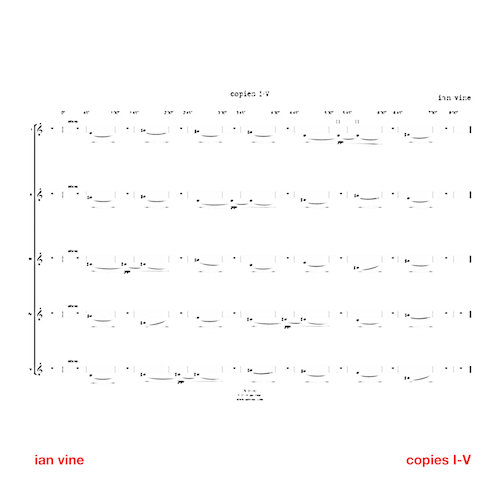 "composer and guitarist Ian Vine creates a cloud of drone and feedback"